Competency-Based Student Assessment: Is Dr. Thomas Guskey Recycling OBE without Student Grades? University of Kentucky student assessment guru Thomas R. Guskey is back on the Canadian Professional Development circuit with a new version of what looks very much like Outcomes-Based Education. It is clear that he has the ear of the current leadership in the Education Department of Prince Edward Island. For two days in late November 2018, he dazzled a captive audience of over 200 senior Island school administrators with has stock presentations extolling the virtues of mastery learning and competency-based student assessment. P.E. I’s Coordinator of Leadership and Learning Jane Hastelow was effusive in her praise for Guskey and his assessment theories. Tweets by educators emanating from the Guskey sessions parroted the gist of his message. “Students don’t always learn at the same rate or in the same order,” Guskey told the audience. So, why do we teach them in grades, award marks, and promote them in batches? Professional learning, in Guskey’s world, should be focused not on cognitive or knowledge-based learning, but on introducing “mastery learning” as a way of advancing “differentiated instruction” classrooms. “High-quality corrective instruction,” he told P.E.I. educators, is not the same as ‘re-teaching.’” It is actually a means of training teachers to adopt new approaches that “accommodate differences in students’ learning styles, learning modalities, or types of intelligence.”. Up and coming principals and curriculum leads, most without much knowledge of assessment, have proven to be putty in his hands. If so, what’s the problem? Simply put, Dr. Guskey’s theories, when translated into student evaluation policy and reporting, generate resistance among engaged parents looking for something completely different – clearer, understandable, jargon-free student reports with real marks. Classroom teachers soon come to realize that the new strategies and rubrics are far more complicated and time-consuming, often leaving them buried in additional workload. Guskey’s student assessment theories do appeal to school administrators who espouse progressive educational principles. He specializes in promoting competency-based education grafted onto student-centred pedagogy or teaching methods. Most regular teachers today are only too familiar with top-down reform designed to promote “assessment for learning” (AfL) and see, first hand, how it has led to the steady erosion of teacher autonomy in the classroom. While AfL is a sound assessment philosophy, pioneered by the leading U.K. researcher Dylan Wiliam since the mid-1990s, it has proven difficult to implement. Good ideas can become discredited by poor implementation, especially when formative assessment becomes just another vehicle for a new generation of summative assessment used to validate standards. Education leaders entranced by Guskey’s theories rarely delve into where it all leads for classroom teachers. In Canada, it took the “no zeros” controversy sparked in May 2012 by Alberta teacher Lynden Dorval to bring the whole dispute into sharper relief. As a veteran high school Physics teacher, Dorval resisted his Edmonton high school’s policy which prevented him from assigning zeros when students, after repeated reminders, failed to produce assignments or appear for make-up tests. Manitoba social studies teacher Michael Zwaagstra analyzed Guskey’s research and found it wanting. His claim that awarding zeros was a questionable practice rested on a single 20-year-old opinion-based presentation by an Oregon English teacher to the 1993 National Middle School conference. Guskey’s subsequent books either repeat that reference or simply restate his hypothesis as an incontestable truth. Guskey’s theories are certainly not new. Much of the research dates back to the early 1990s and the work of William Spady, a Mastery Learning theorist known as the prime architect of the ill-fated Outcomes-Based Education (OBE) movement. OBE was best exemplified by the infamous mind-boggling systematized report cards loaded with hundreds of learning outcomes, and it capsized in in the early 2000s. in the wake of a storm of public and professional opposition in Pennsylvania and a number of other states. The litmus test for education reform initiatives is now set at a rather low bar – “do no harm” to teachers or students. What Thomas Guskey is spouting begs for more serious investigation. One red flag is his continued reference to “learning styles” and “multiple intelligences,” two concepts that do not exist and are now considered abandoned theories. Guskey’s student assessment theories fly mostly in the face of the weight of recent research, including that of Dylan Wiliam. Much of the best research is synthesized in Daisy Christodoulou’s 2014 book, Making Good Progress. Such initiatives float on unproven theories, lack supporting evidence-based research, chip away at teacher autonomy, and leave classroom practitioners snowed under with heavier ‘new age’ marking loads. A word to the wise for P.E.I. Education leadership – look closely before you leap. Take a closer look at the latest research on teacher-driven student assessment and why OBE was rejected twenty years ago by classroom teachers and legions of skeptical parents. What’s really new about Dr. Thomas Guskey’s latest project known as Competency-Based Assessment? What is its appeal for classroom teachers concerned about time-consuming, labour-intensive assessment schemes? Will engaged and informed parents ever accept the elimination of student grades? Where’s the evidence-based research to support changes based upon such untested theories? Report Card Edu-Babble: Where Does the Gibberish Originate — and Why Does It Continue? The arrival of Nova Scotia Student Report Cards in June 2013 provoked quite a reaction from parents, particularly those with students in Atlantic Canada’s largest school board. “Ridiculous.” “Meaningless.” “Mumbo-jumbo.” Those were just a few of the words used by Halifax region parents to describe the computer-generated InSchool reports utilizing PowerSchool, the province’s new $6 million student information system. After an initial attempt by Deputy Education Minister Carole Olsen to deflect the stinging criticism, the Minister Ramona Jennex, Chair of CMEC, was compelled to intervene, promising to look into the concerns. Education officials in Nova Scotia were clearly taken aback by the reaction and acted like it was news to them that the canned reports were incomprehensible to most parents and virtually every student, certainly in the elementary grades. Education Reporter Frances Willick deserves credit for unearthing the latest parental outcry, but the concerns are not new, nor will they be fixed by a few cosmetic changes on student reports. Some twenty years ago, educators were confronted with a wave of educational reform focused on introducing Outcome Based Education (OBE) and increasing demand for standardized testing to provide more assurance of student achievement levels. Most educational administrators and consultants reacted instinctively against such intrusions and adapted by developing some rather ingenious counter measures. Unable to stop the advance of standardized assessments, they resorted to retaining control of student reporting and turning it to different purposes. Student reports cards have been filled with gibberish since at least the early 1990s. Much of it can be traced back to a February 1993 Ontario Ministry of Education document known as The Common Curriculum, Grades 1 -9. That document introduced teachers to the term “learning outcomes” and attempted to destream Grade 9 and replace a subject-based curriculum with more holistic cross-curricular understandings. In the case of Language Learning Outcomes, reading was downgraded and the word “spelling” dropped from the elementary lexicon. After parents rose up calling for “a set curriculum with specific goals,” the so-called “dumbed-down curriculum” was shelved, but a new student evaluation system based upon “meeting provincial outcomes” survived. Intended as a means of providing parents with regular communication reflecting measurable standards, OBE student report cards become quite the reverse. School curriculum was re-written around “learning outcomes” and professional development was geared to teaching teachers the new “educratic” language. Communicating with parents gradually morphed from providing personal, often candid comments about students, to tiny snippets reflecting the “expected outcomes.” When Student Reports became standardized and machine-generated, the “student outcomes” jargon became entrenched and accepted, rather sadly, as a demonstration of teaching competence. Standardizing report cards became a vehicle for implementing the new orthodoxy. In Canada’s provincial systems, OBE was captured by educators who opposed testing and sought to undercut its influence with “assessment for learning.” Grading and ranking students, once the staple of teaching, became dirty words and the initial standardized reports sought to replace marks with measures of formative assessment. Ontario’s first Standardized Report Card, eventually rejected, attempted to introduce a new set of incredibly vague measures such as “developing,” developed, and “fully developed” understandings. Today’s standardized report cards, as bad as they are, could well have been worse. Many professional teachers, particularly in high schools, resisted the “dumbing down” of curriculum and the invasion of ‘politically-correct’ report writing. The leading teachers’ unions, the OSSTF, BCTF, and NSTU, opposed student reporting that chipped away at teacher autonomy and consumed more and more of a teacher’s time to complete. In Nova Scotia, for example, the Grade 9 to 12 reports may be littered with edu-babble comments, but they still provide percentage grades. In Grades 1 to 8, the reports still retain a watered down letter grade system. What can we finally secure personalized, common sense Student Report Cards? Is it just a matter of linguistic cosmetics or part of a much deeper problem entrenched in the current educational system? What needs to be undone, before we restore sanity to student reporting? “Do-Over” Student Evaluation: What Lesson Does Pardoning Cheaters Teach? Publicly announcing the Newfoundland school board’s new policy is what really sparked a firestorm of protest. President of the provincial Teachers’ Association Lily Cole spoke out, saying that teachers were not only frustrated but very unhappy with the policy which took responsibility for teaching “responsibility, respect, honesty, and values” away from regular teachers. “This just takes it out of our hands,” she told both CBC News and The Toronto Star. Student assessment experts like Damian Cooper pop up everywhere because most school boards are desperate to improve their idiosyncratic, autonomous, teacher-driven student evaluation practices. Over the 2009-10 school year, Cooper was hired to give “Tools for Assessment” Workshops from one end of the country to another, including prominent recorded talks in Vancouver, Barrie,ON, and Sackville, NB. From July 5 to 8, 2010, he was the sole presenter a a two-day intensive Workshop, entitled “Fostering Assessment Literacy in Our Schools” sponsored by the CMEC -Atlantic section, and funded by NB Education and all four teachers unions. How were Damian Cooper’s assessment theories seeded in the Maritimes? Look no further than the the Assessment Summit, held in late August 2009, at Halifax’s World Trade and Convention Centre. Close to 600 school officials and teachers attended the extravaganza headlined by Damian Cooper, Ken O’Connor, and Rick Stiggins, head of Educational Testing Service (ETS) Assessment from Portland, Oregon. Since the Newfoundland cheating policy change hit the news, an eerie silence has descended upon Student Assessment Divisions in most Canadian school boards. Superintendent Rice and NLSBA Executive Director Brian Shortall, supported by Cooper, have been fending off a wave of vocal opposition, leveled by irate parents, taxpayers, teachers and high school students. Over 75% of all respondents to a CBC News St. John’s poll were adamantly opposed to “pardoning” student cheaters. On the CBC Radio Maritime Magazine show (October 29), “Mind the Gap,” Shortall offered a rather feeble defense of the change and received some tacit support from NB Superintendent Karen Branscombe (NB District 2, Moncton). Giving student cheaters a second chance is symptomatic of profound changes now underway in student assessment policy. Where is the educational research to support the student evaluation theories being espoused by Damian Cooper and his cohorts? Does separating completely student achievement from student behaviour in the evaluation process make any real sense — and what are the likely consequences? Should student cheaters be pardoned in our schools? Taking the larger view, is all of this threatening to produce what might be called a “do-over” generation? Standardized Student Reports: Can Progress be Measured without Grades? Student reports have emerged, once again, as a battleground in the contested terrain of Canadian public education. Ontario initiated the latest round of “report card reform” by announcing that the Ministry of Education would issuing fall report cards without real marks to elementary school pupils starting in the fall term 2010. In Nova Scotia, the Education Department has also begun to implement PowerSchool, a flashy new $4.5 million centralized Student Information System with province-wide attendance tracking and its own brand of standardized student reports. The Nova Scotia pilot project has been a “schmozzle” with new mid-term reports delayed in many of the 78 pilot schools. Although Ontario is no longer considered Canada’s leading education province, public education reforms there have a way of popping-up elsewhere, and particularly in the Atlantic provinces. So far, Ontario is the only province moving to only two elementary report cards with letter grades per year. In 2010-11, one will be issued in late January or early February, the other at the end of the school year in June. For veterans of earlier battles in the early 1990s against “dumbed-down” standardized student reports the early signs are ominous. Nova Scotia’s latest education reform is driven by Pearson Education software technology imported from California. It was also launched in early November and purports to be a step in the direction of providing students and parents with more timely information on achievement, homework, attendance, and grades. Does the Nova Scotia student evaluation system stand up under closer scrutiny? 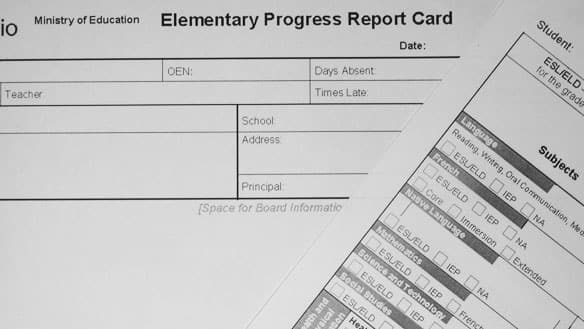 The new Student Report Cards will be standardized, but still retain traditional marks. So far, so good. Student reports for Primary will be purely anecdotal, but Grades 1 to 8 will be based upon Letter Grades and comments, while Grades 9 to 12 will retain percentage grades and subject comments. One strange variation for Grades 1 to 8 is the absence of the whole “excellent or outstanding” from the appalling “expected learning outcomes” scheme. No Nova Scotian elementary pupils will ever be found to be either “excellent” or “outstanding.” What a pity! When it comes to the comments, the now familiar “learning outcomes” lingo will almost certainly render them incomprehensible to most parents. The first skirmish is underway now in Ontario. “Education Premier” McGuinty has promised “clear, understandable reports” written ” in plain English.” Close educational observers remain skeptical. 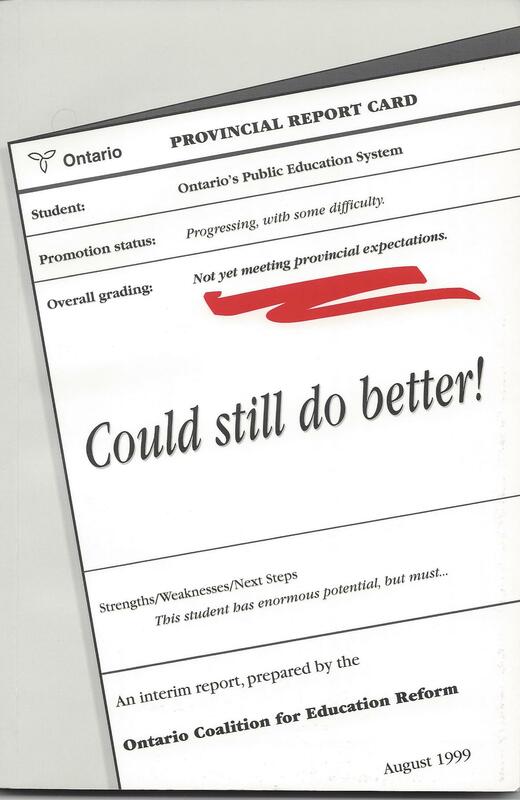 In introducing the new Progress Report on CBC-TV’s The National, a Toronto Board consultant offered a bizarre comment straight from the Hall-Dennis school of “romantic progressivism.” When asked why grades had been eliminated, she contended that “bad marks’ lowered a pupil’s “self-esteem.” Yes, woolly-headed OISE thinking still lives in some boards. The public debate in Ontario is now focusing on the relationship between report cards and public accountability for better student results. MCguinty and his EDucation Minister are defending the new Progress Report and insisting that the new system provides more emphasis on learning skills and work habits, assessing students on their organization, independent work, collaboration and initiative. Opposition Leader Tim Hudak (PC) has staked out his ground. Last week, Hudak went on record claiming that an Ontario Conservative government would put the grades back in fall report cards. “These are really no longer report cards. They’re simply vague progress reports that are not giving parents the information they need about their children’s success,” Hudak said Wednesday. “Basically, Dalton McGuinty is now experimenting with report cards and taking away the grades and the comments that help parents make important choices about their children.” He also said parents shouldn’t have to wait until late January or February to know precisely how their children are scoring in individual subjects. Standardized Student Report Cards invariably become a battleground in the ongoing debate over the real purposes of teaching and learning in our public schools. Just when education reformers think that the “romantic progressives” are in retreat, they come up with new ways of ‘socializing” today’s students in pursuit of what Kathleen Gow aptly termed the “God of self-esteem” Most teachers, and certainly parents, want an earlier assessment to ward off potential problems. It’s all about whether those assessments actually provide a measure of student achievement or simply serve as convenient tools of social promotion. Where do you stand on the contentious question of Student Report Cards? Should Ontario put grades back into its fall mid-term reports? How can parents secure Report Cards that actually provide meaningful, individualized student appraisals? Is there something about Standardized Report Cards that smacks of bureaucratic convenience rather than meaningful authentic assessment? It’s high time for a national conversation about this fundamental educational issue.